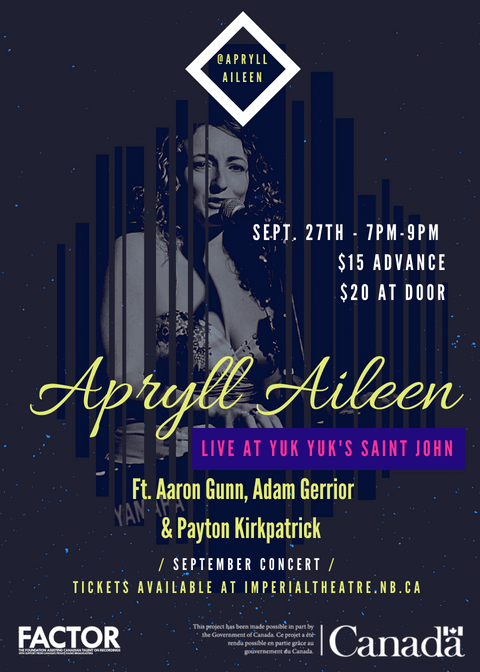 SAINT JOHN, NB: New Brunswick Singer Songwriter Apryll Aileen will take the stage on Wednesday, September 27th at Yuk Yuk’s Comedy Club in Uptown Saint John. It is the first time Aileen will perform at the venue and she is excited to share some new material she has been working on in Los Angeles, CA and Toronto, ON. The evening will consist of musical talent and spoken word poetry. Joining her onstage will be Saint John based Aaron Gunn, poet Mikayla Hanlon from the Interaction School of Performing Arts and percussion player Adam Gerrior, from St. Andrews. Apryll Aileen combines smooth, sultry vocals with her classically trained piano background, captivating her audience with beautiful melody, soulful passion and engaging lyrics. Compared to the likes of Sara Bareilles & Norah Jones, Aileen dabbles between indie pop, jazz & blues while sharing stories about her free spirited, serendipitous road trips through North America and the United Kingdom. Following her heart, Aileen spent the majority of 2016 on the road, touring in the United States, France and the United Kingdom. With a Kerouacesque élan, she continues her journey while chasing her dreams of perfection, and realizing that it all starts within. Aileen’s experiences have led to her writing songs for her next album, “HOME” , which touches on themes of overcoming negative thought patterns, being afraid of commitment, finding her inner voice, and realizing the importance of self love and acceptance. Tickets are $15 advance and $20 at the door. Tickets are available through the Imperial Theatre’s Box office, online at http://www.imperialtheatre.nb.ca/events/ or by phone: 1-800-323-SHOW (7469).